The nature of fastpacking and key considerations when planning for a fastpacking trip in Nepal. For simplicity, let’s say fastpacking is a marriage between trail running and backpacking. The idea is you move light and fast, carrying only essential items, without sacrificing safety. One reason people are drawn towards fastpacking is its non-competitive nature. Unlike trail running events where runners are timed and are under a competitive microscope, fastpacking offers a non-competitive setup where the participants can stop, smell the flowers, or talk to local people without the need to constantly check their watch. A waterfall or a giant shower head? In Nepal there are hundreds of thousands of trails. From one day to four months, there is something for everyone in the Himalayas. Most of the trails in Nepal are made by locals to commute from one village or a region to another, and can be connected by trekkers to form longer routes. The abundance of trails and remote regions make Nepal a paradise for backpacking, trail running and fastpacking. If you want to cover big distances in short number of days while exploring multiple ecosystems, people, cultures, then fastpacking is for you. Take our word, the views will keep you moving. If you do some form of exercise involving legs and cardio, and know the basics of hiking/backpacking, you can do fastpacking. Make sure you try gear before the trip especially shoes and backpack (loaded), and practice moving with them to get a sense of how challenging your fastpacking adventure will be. 2. How do I train for fastpacking? Walk/jog/run with a backpack weighing at least 5kgs. Simulate multiple days ideally on the trail by carrying your pack for several days in a row so that your legs and body know what’s coming. You can alter distances as you like. Mix it up with longer and shorter distances, and make sure you find some hills (or a stair-stepper) to practice on! If you have done good research of the region where you are going, and have paper maps, gpx tracks, and/or a compass, you can explore many places in Nepal without a guide. However, having a guide can be helpful to get to know the local culture, flora and fauna, booking lodges or just for an added safety if you get injured or sick. Some areas of Nepal are restricted, and foreigners are required to have permits and a guide for going into these areas. Please check requirements for the area you are going (more on next point). 4. What permits are needed to fastpack in Nepal? Nepal requires a fair number of fees and permits for trekkers and fastpackers, but these can be easily obtained if you plan ahead. As a non-Nepali, most regions require at least two documents; 1) Trekkers Information Management System (TIMS Card) and 2) national park fee. 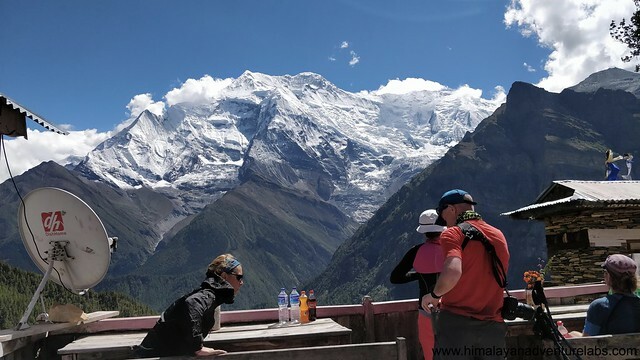 Special Trekking Permits are needed for restricted/controlled areas, which include most trekking destinations besides Annapurna, Everest, Langtang, and Helambu. If you are contracting with a guiding company, they can help obtain permits for you, but it is possible to do on your own in Kathmandu. To learn more about different kinds of permits click here and here for fees. We recommend buying your gear from your favorite local outdoor store! You can buy lots of different gear in Kathmandu; there are tons of shops. However, the quality can vary widely and sizes for women might be difficult to find. It is helpful to arrive early in Kathmandu so you have time to walk around Thamel to get last-minute gear, change money, and complete some final errands. You can visit this Gear Page on Himalayan Adventure Labs’ (HAL) website for comprehensive list of gear, specific recommendation for Annapurna and Langtang. Note that the gear choices we list on the website are not recommendations; they are simply a statement of our own personal experiences and feedback from past participants. Ultimately it is your choice what to bring. The page also has a custom gear list (with non-affiliate links) by Jason and Heather, graduates of Annapurna Fastpack 2017 and Langtang Fastpack 2018. 6. When to go fastpacking in Nepal? Nepal is open for all seasons. Spring lasts from March to May with warm temperatures and clear skies (mostly). Summer, from June to August, is the monsoon season when the hills turn lush and green. Temperatures can get quite warm, up to 30°C and more during heat waves. If you have to travel long distances in monsoon do ask your local operator to check on road conditions, or alternatively you can check with local traffic police by calling their hotline (dial 103). Autumn, from September to November, is cool with clear skies and is the most popular season for trekking — which means you will also see tons of trekkers on popular trekking trails. In winter, from December to February, it is cold at night with temperatures sometimes below zero. However, the maximum temperatures can still reach up to 20°C. Well, it depends on your training! If you are fastpacking, anywhere from 10 to 30+k is ‘normal’. However, as you go higher your pace will decrease due to change in altitude. If you feel unwell at altitude, assume you have altitude illness until proven otherwise. Never ascend with symptoms of Acute Mountain Sickness (AMS). If you are getting worse (or have HACE or HAPE), go down at once. At altitudes above 3000 meters (10,000 feet), your sleeping elevation should not increase more than 300-500 meters (1000-1500 feet) per night. Every 1000 meters (3000 feet) you should spend a second night at the same elevation. Many trekkers choose to take Diamox (Acetazolamide) which is used to prevent and reduce the symptoms of altitude sickness. Please check with your physician before considering taking diamox or any major medicine on the trail. If you are doing a tea house fastpacking then you don’t have to carry food (apart from snacks). Dal bhat is ubiquitous, a staple food of Nepal which consists of rice, curry and lentils. Despite their best efforts, many trekkers in Nepal experience gastrointestinal issues at some point during their stay. M Avoid this by washing your hands with soap before and after you eat (especially under your nails). It is understandable that washing hands in sub zero temperature is hard. In that case carry and use hand gel at all times. If you run out of hand gels you can buy it at major trekking towns on the trail. It is also important to be careful about what you eat and drink. Be sure to purify your water with chlorine or iodine tablets, a SteriPen, or a filtration system of some kind. We have had positive reviews for Katadyn: Water Filters from our clients. You will see Nepali people drinking straight from the tap, but don’t try that unless you want to spend the night in the bathroom! Also be careful to eat foods that are hot and cooked (dal bhat is usually safe), and if you are eating raw fruits or veggies, rinse well with purified water. Packaged foods like cookies and candy should be fine! In the Himalayas you should be responsible for your own personal first aid kit. Always bring a small blister kit, some bandages, and at least one elastic bandage. Carry prescription medicine as necessary, and be sure to have antibiotics and altitude medication in case of sickness. Carrying an inhaler can also be helpful for those with breathing issues that might worsen at altitude. It can also be helpful to carry vitamin C pills, as fruit can be hard to come by in the mountains. Most of the places and people are not lucky like this guy with a cellular coverage. So, we recommend to carry either a sat phone (Thuraya) or a sat communicator like inReach®. If things go south you will be relieved to have a sat device to make a crucial call to ask for help. Also, get heli evacuation and medical insurance. We recommend World Nomads. – Written by Sudeep Kandel. Sudeep is an ultra marathon runner, a registered trekking guide and a co-founder of Himalayan Adventure Labs’ (HAL). He has a (proud) DNF for East-West Nepal run (850/1027 kms), the FKT on Manaslu Circuit with Seth Wolpin (co-founder of HAL) and many adventures under his belt. When not in woods he is busy planning/organising trips and working on tourism development related projects. Himalayan Adventure Labs (HAL) is a pioneer in fastpacking events in Nepal. HAL adventures are designed for trail runners and ultralight backpackers who want to cover big distances in the mountains and get off the beaten track. This non-competitive format also means they can stop and visit temples and smell flowers along the way. Check out Himalayan Adventure Labs for more information. Trail Running Nepal members get a 10% off on HAL trips with the discount code ‘TRN-HAL2019’! More photos from fastpacking trips in Nepal! This entry was posted in Blog, Resources and tagged Fastpack Nepal, fastpacking, Running tours in nepal. Bookmark the permalink.